The figure of Chris Knox towers over the already impressive skyscrapers of the Flying Nun stronghold like Godzilla reering up behind the Tokyo skyline. And, like that mythical beast, Knox is sort of a myth himself, with stories of his mad genius the sort of evidence of how the Flying Nun sound was being pushed in new directions, a bit further away from the chamber pop of The Chills, or the ramshackle fury of The Verlaines. Knox succeeded in creating what we'd call lo-fi rock long before anyone ever thought to coin the term. A good decade before the flourishing of Robert Pollard and his crew, this guy was making similarly memorable rock that bridged alternative with the legacy of The Beatles. You doubt me? Check out the masterful reissues of Weeville (1990) from Tall Dwarfs (Knox and Alec Bathgate) and Seizure (1989), both out this week via Flying Nun. Seizure (1989) blazes out of the gate with "The Face of Fashion" which offers skewed pop that made me think of both The Move and The Jesus and Mary Chain ("You Trip Me Up") -- no mean feat, that! "The Woman Inside Me" oddly and wittily charms, while "Statement of Intent" resembles nothing so much as a punk cut being turned into a sort of fast folk number, such is the nature of Knox's work that it defies easy summary. And, yes, this is the album that contains perhaps Chris Knox's best known song ("Not Given Lightly") which here shines on this crisp sounding reissue from Flying Nun Records. For the most part, you can sense that these were songs Knox cranked out at home on an acoustic guitar and then fleshed out later -- is there any other way to do this sort of thing? -- and sometimes on the slower numbers ("And I Will Cry") you really appreciate the knack for melody that this guy had back then in 1989, close to his peak. 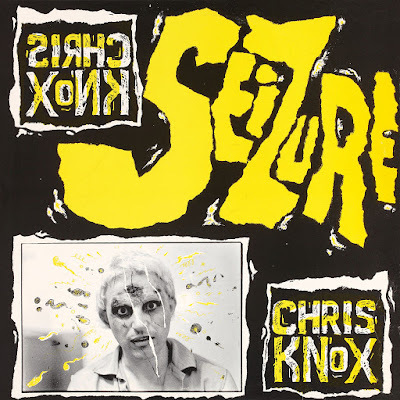 Elsewhere on Seizure (1989) there are tracks that are more ferocious ("Grand Mal" and "My Dumb Luck") and show off Knox's skill with the guitar. What could be off-putting about the music of Chris Knox is that it's both heartfelt and funny, lo-fi and carefully conceived. Given those paradoxes, maybe a new listener doesn't know how to approach this stuff. Within the rigid lines of genre, Knox was merrily skipping over the markers and making his own. To me, that's what makes him a genius and what makes Seizure (1989) such a good example of his craft. 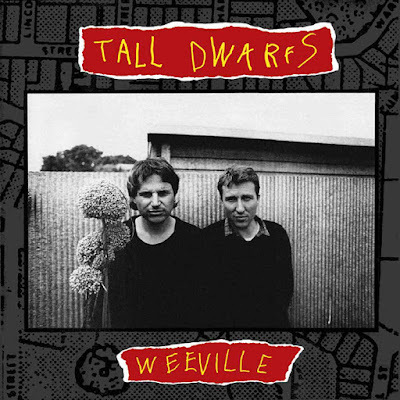 Still, you want more typically NZ pop stuff then you go grab Weeville (1990) by Tall Dwarfs, Knox with Alec Bathgate. There's something decidedly more conventional -- as you'd expect from what's frequently billed as the first "proper" Tall Dwarfs album -- here on this album. Released in 1990, Weeville finds Dwarfs Bathgate and Knox cranking through 16 tracks of concise, punchy, and tender numbers of what we'd now call indie-pop. If "Lag" opens things on a decidedly beautiful Nilsson-esque note, then the following "What More" is the near-country stomp of the sort heard on Led Zeppelin III, or one of those Kinks albums where Brothers Davies thought they were suddenly Americans. "Skin of My Teeth" and "Crawl" offer up the sort of chamber pop that The Chills did so well in this same era, while "Sign The Dotted Line" sounds like nothing so much as Robyn Hitchcock when he went acoustic (which he was doing in this same era on Eye, I should add). But there are many ways to do acoustic and "Mr. Brocolli" is another altogether. Sounding like a more straightforward and lucid Syd Barrett, Knox strums in support of one of the melodic highlights on an album full of them. "Lie" is another winner on Weeville and it trades in the acoustic for a wonderful piano riff that seems to take this song to another level entirely. Gentle and rough-edged, this is exactly why the music of the Tall Dwarfs is so cherished; I can think of nothing else that sounds like this one, really. Weeville wraps things up on the quiet charms of "Rorschach" and the pointed critique of "Hallelujah Boy", one of the other obvious highlights of this album. The barbs directed at religious converts, apparently, are sharp and not overbearing as is Bathgate's vocal performance (as I think that's him singing this one). Prefiguring the sort of lo fi that Guided by Voices an Elf Power would make some years later, Weeville from Tall Dwarfs is a crash-course in how to make smart and effervescent indie that never overstays its welcome. When each track is this concise, it's hard to find fault with much on this record. The charms are many and the joys just as numerous And while I'd love to turn this review into a Chris Knox love-fest, the many talents of Tall Dwarfs band-mate Alec Bathgate shine brightly on Weeville (1990). Seizure from Chris Knox and Weeville from Tall Dwarfs are both being reissued by Flying Nun Records this week so pre-order your copies before November 13. Readers in the United States can get special deals with free shipping via these 2 links: here for Seizure by Chris Knox and here for Weeville by Tall Dwarfs. Learn more about both Chris Knox and Tall Dwards via Flying Nun Records.